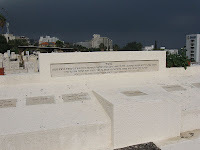 Picture a Day - The Holy Land Revealed: Does Anyone Know about the Massacre of 19 Jews in Tiberias in 1938? Does Anyone Know about the Massacre of 19 Jews in Tiberias in 1938? Tragically, there is a long list of massacres of Jews over the last 100 years in Eretz Yisrael: 1929 in Hebron, 1929 in Safad, 1948 the Hadassah Hospital convoy, 1948 Kfar Etzion, 1972 Lod Airport, 1978 Coastal Road, Passover 2002 Park Hotel in Netanya, to list just a few. But missing from many of the martyrs' lists and the Israeli public consciousness is the massacre of 19 Jews of Tiberias on October 2, 1938, in the height of the "Arab Revolt in Palestine." An organized force of Arab militiamen attacked the neighborhood from several directions. Why is the account missing? Perhaps because of the absolute failure of British authorities and Orde Wingate's (Jewish) Special Night Squads to protect the Tiberias community. The Mandate was aflame, but virtually no one was guarding the 6,000 Jews of Tiberias. Just three weeks later, an Arab assassin gunned down the Jewish mayor of Tiberias, Zaki Alchadeff, in broad day light. "On October 2nd there occurred a general raid on the Jewish quarter of Tiberias. It was systematically organized and savagely executed. Of the 19 Jews killed, including women and children, all save four were stabbed to death." Receive a Daily Picture by subscribing in the right sidebar and clicking "submit." Click on the photos to enlarge. 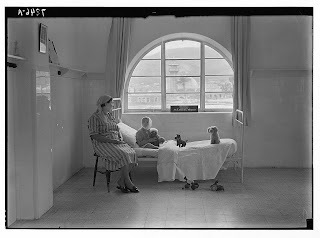 Click on the captions to see the originals. The photographers from the American Colony photography department visited Hebron soon after the massacre in 1929 and produced the photos published here more than 80 years later. It is quite possible that the photographers traveled to Tiberias after the massacre. 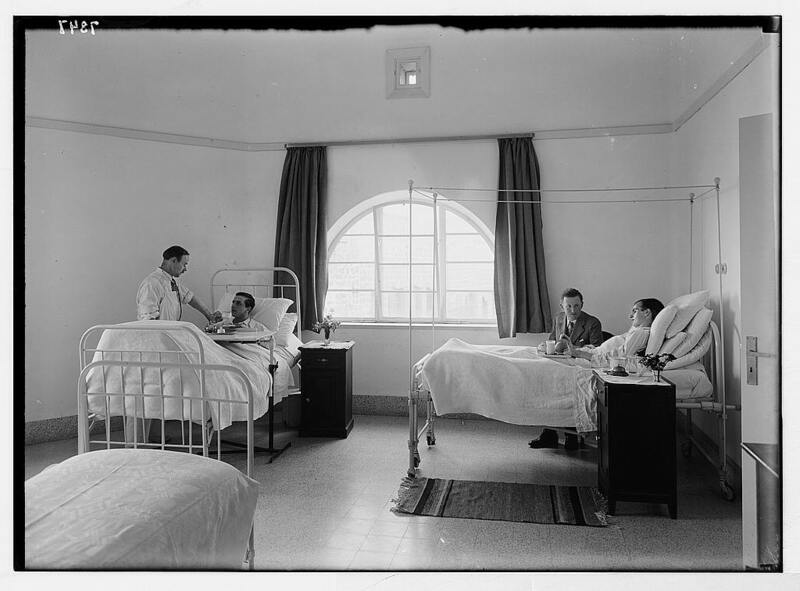 A series of pictures were taken at the Scots Mission Hospital in Tiberias, but the photos are dated as "between 1934 and 1939." 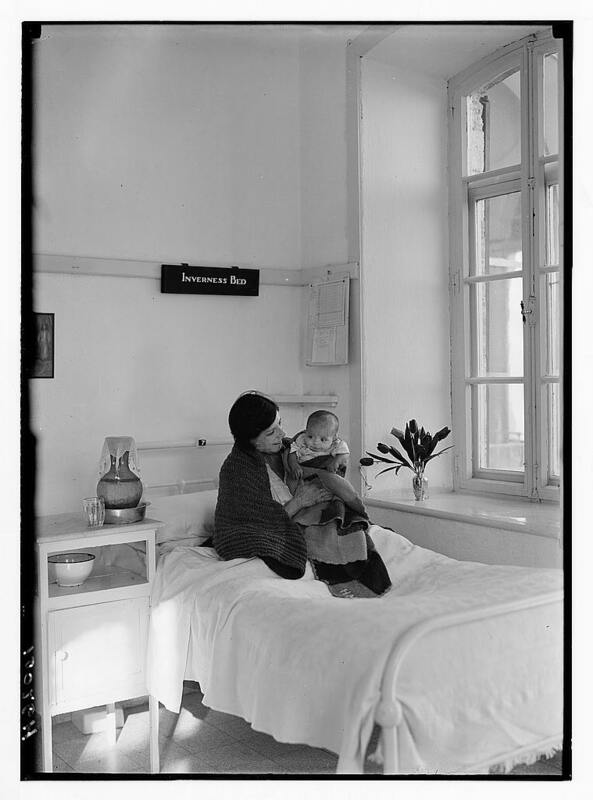 One picture shows "a little Jewish boy." Another picture shows two British soldiers. Other pictures show unidentified patients. wounded in the Arab attack? ﻿ ﻿Other hospital pictures can be viewed here, here and here. 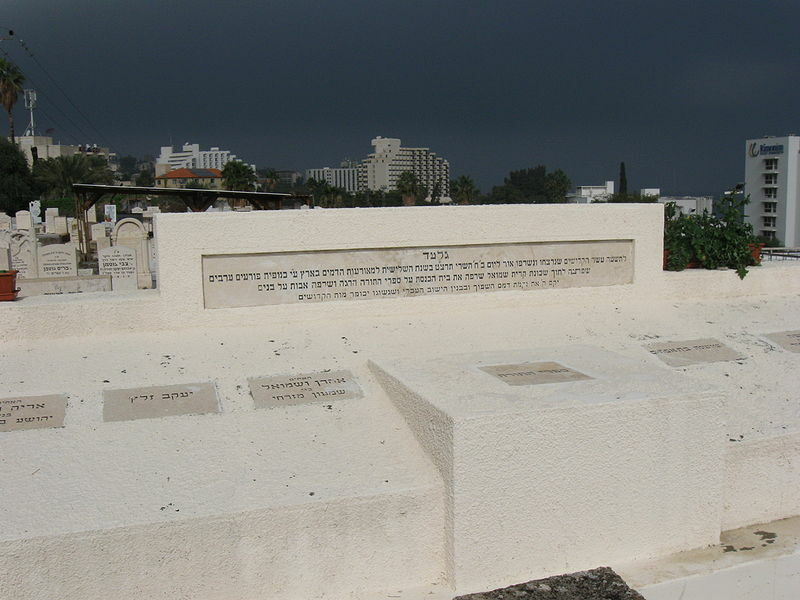 Read the words of The Last Survivor of the 1938 Tiberias Massacre. Read Ha'aretz' account from October 3, 1938. The Arab Revolt was a particularly brutal conflict in which it was rarely possible to distinguish combatants from civilians, and atrocities were commonplace on both sides. Indeed, one of the rampages Segev attributes to Wingate occurred immediately after the slaughter of nineteen Jews in Tiberias, eleven of whom were children burned to death in their beds. "...Of all our actions I remember one specifically: after the massacre in Tiberias we surrounded the village of Lubiya, and there we assassinated them - we killed some ten of theirs". How did you know who committed the massacre? Wingate had his methods. Firstly, he knew Arabic, and secondly he had good intelligence, which he received from the Hagana and from people whom he 'handled' in the field on his own..."
"...the Jewish population of the town of Tiberias along the Sea of Galilee was targeted. A massacre of civilians including children took place on the 2nd of the month as group of rebels infiltrated into the Jewish quarter. The British battalion stationed in the town was scattered for the weekend and did not intervene, many remaining pinned down in their barracks and taking cover in the streets. Dead civilian bodies were burnt, the attackers then taking to looting and drinking. Wingate was out with a small SNS force nearby that night setting an ambush and heard the news. He took a handful of men with him to Tiberias to set an ambush for the Arab raiders on the road leading west out of town. The road leading out steeply climbs and backtracks along a hill, and here Wingate and his men waited. He struck the retiring Arab force, and the action was followed up by an attack of a Fo'sh company led by Allon. Together they inflicted around 40-50 casualties, out of some estimated 70 attackers.18 The Bitish military commander of the Middle East, General Ironside, happened to be in the country. He quickly rushed to the scene. The poor performance of the British battalion and his sacking of its commander, and the death and destruction put him in a foul mood. At the top of the hill outside Tiberias he encountered the bearded Wingate in his pith helmet. "And who are you?" he demanded of him. "I'm Wingate," came the firm reply back.19 Listening to his accomplishments, and contrasting his work with the ineffective British effort, Wingate fostered a lasting impression upon the general. The next day pursuit of a terrorist band ended in success at Mount Tabor. On the way back to Nazareth Wingate recognized several guerilla leaders traveling in a passing taxi. With the nearby SNS platoon led by Bredin they chased it to Dabburiya where the remnant of the guerilla group had taken refuge. Wingate and some men fought their way into Dabburiya and collected 15 enemy dead.20 Bredin and the rest of his platoon followed some escapees up Mount Tabor, encountering resistance and exchanging gunfire around the Benedictine monastery. Contact was hurriedly sent to a local RAF squadron. Several aircraft eventually appeared but with the inability to tell friend from foe they proceeded to bomb and strafe the SNS men, fortunately with no casualties. This action was to be Wingate's last in command of the SNS." The Horrifying massacre of the Jews of Hebron, known as the “1929 Riots,” resembles the most brutal of pogroms against Jewish communities in Europe. It dealt the Hebron community a devastating blow, from which it is still trying to recover and led to the destruction of the Jewish presence on the central mountain area of Judea, which was rendered “Judenrein”. The traditional Jewish community in Hebron was far removed from any political confrontation or national conflict. Jews and Arabs had inhabited the town for many generations, at times in peaceful coexistence and as good neighbors. The Jews had done much for the town’s economy and its development, of which the main beneficiaries had been their Arab neighbors. The wave of terror was set in motion by Amin al-Husseini, who, after being appointed by the British to the post of Mufti of Jerusalem in 1921, launched a campaign of systematic incitement against the country’s Jewish population in order to inflate his personal status. (The Nazi tendencies of the Mufti - “founder of the Palestinian National Movement” - were revealed later on, during the Holocaust. In 1941, Husseini visited Berlin, met with Hitler and established a Muslim division in the Nazi SS for the ultimate purpose of annihilating the Jews of Eretz Israel. He is considered one of the most notorious war criminals of the time.) The Mufti exploited Jewish demands for worship rights at the Western Wall as a pretext to incite the country’s Arab population, calling for a jihad against the Jews for ostensibly conspiring to demolish Al-Aqsa Mosque. The Jews of Hebron, having nothing to do with any such matter, could not believe that the malevolence would find its way to the city of the Patriarch Abraham. Indeed, on the eve of the riots, a squad of Hagana fighters visited Hebron to offer its assistance but was asked to leave in order not to fan the flames. The bloodshed in Hebron began after riots erupted in Jerusalem on Friday, August 23, 1929. 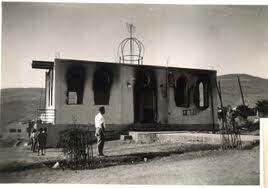 Inflammatory sermons were delivered in mosques and rioters began to attack Jewish homes and the Slobodka Yeshiva. The devoted yeshiva student Shmuel Rosenholz was stabbed and stoned to death as he labored over his Talmud. The British police did nothing to protect the Jews. Their commander, Major Raymond Cafferata, reprimanded Jewish community leaders who had come to plead for protection and instructed them to hole up in their homes, which were then turned into death traps.